About 30 years before I attended FEI’s Leadership for a Democratic Society (LDS) course, you would have found me running around the halls of FEI, ducking in and out of offices, riding my bike on the driveway or working on homework in the computer lab. It’s hard to recall all the details but I mainly remember everything seeming bigger. Starting with buildings on a hill that I would point to when I drove past with friends—“no, that’s not the FBI, it’s the F-E-I”—and the imposing columned-façade of the main building with the driveway that can’t help but announce something impressive, it all left an indelible mark on me that FEI was special. There were important things happening there and important people were always in the hallways—leaders shaping the way the government would function and seeking to be the best they could be. Starting in the late 1980s, my mother, Pam Gwin, was on the faculty at FEI. Her career up until that point had taken her from elementary school teacher in Alabama to a master’s-by-mail degree from Troy State University to a Ph.D. from Duke University. I showed up during the Ph.D. phase and tagged along everywhere she went after that. Despite my young age when she first started at FEI, I do have some strong memories—playing under her desk, trying to draw my own copies of the organizational seals hung around the building. A few places were off-limits to a child like me—the gym, the old lounge outfitted with pool tables, the swimming pool if LDS students were using it. But that never kept me from exploring the property and meeting my mom’s friends and colleagues. The excitement was everywhere. Everyone I met was clearly a true believer in the mission of FEI, and the place genuinely felt like the homestead of a large, extended family. As I grew older and my mother’s career at FEI continued, I remember some stand-out events. For example, in the fall of 1989, I recall the Old Dominion Room decked out for a fancy dinner. I was sitting at a table with my mother and father, dressed up beyond comfort and talking to a very nice German man who, upon reflection, I believe was a senior West German diplomat. The fall of the Berlin Wall was imminent or it happened that day—either way, I recall vividly the celebration, toasts, and cheers that night. The nice German man gave me a small West German flag and some mention was made of history—to be honest, I was mostly excited about getting a neat flag that I could add to my collection. More than the singular moments, I recall the way my mother talked about FEI and its mission—the importance of what it was that the faculty and staff did there. As a constitutional scholar, she believed firmly in the role of the civil service in protecting constitutional values, and she believed FEI was a unique and special place where already-accomplished government executives would come to grow as leaders and individuals. Even from a young age, as FEI was building a new curriculum, I understood that the Leadership for a Democratic Society course was a unique opportunity. Graduations were a big deal. I remember a few on the front lawn in the summer months, and I mainly just remember being in awe of the people I encountered across the facility grounds. As I discussed with my classmates in my own FEI class (LDS 423 - June 2016), returning to FEI was a chance for me to learn the lessons that my mother spent all those years teaching. I hadn’t yet truly started my leadership journey when she passed away unexpectedly in 1998 while she was FEI’s assistant director of academic programs. A few months before she passed away she gave me a clock inscribed with the words “Find True North” as a high school graduation gift, and those words and the meaning she had taught me stuck with me through my career. She explained that the magnetic compass one might use to find their way was actually incorrect, and that divining true north was a much harder thing to do. It was a statement about science and character, and I think the concept resonated with her as she embarked to help our civil service leaders find their true norths—through a strong grounding in constitutional values and self-awareness. 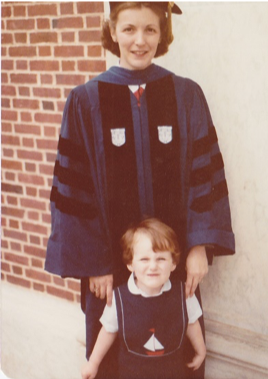 Returning to FEI brought me full circle and gave me the opportunity to work through the curriculum my mother helped to develop and learn the lessons the faculty at FEI felt were so important for leaders in the Federal Government. It was also a chance to connect with many people who had worked with my mother and learn from them what so many generations of leaders had learned from her and her colleagues.